In 1963, "Dee Edwards" began her career with the band from Detroit "the Paragons", an R&B vocal group, who has only recorded a single "My Time Is Important To Me / Pretty". Best known in Northern soul circles, Dee has also recorded 2 monster tracks in the 70s such as why can't there be love / say it again with feeling in 1972 and her very in-demanded Modern soul "(i can) deal with that" in 1977. 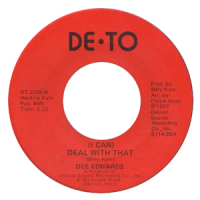 Dee Edward made a great second version of "(i can) deal with that" in 1990 : (i can) deal with that / (i can) deal with that (instrumental). Before signing these 2 LPs heavy love & two hearts are better than one for the "Cotillion" label, she made another single don't sit down (stereo) / don't sit down (mono). Dee Edwards died of natural causes on January 25, 2006.